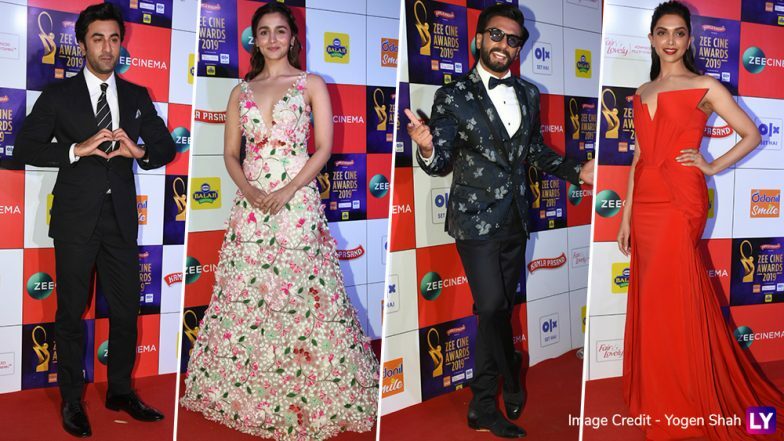 Ranbir Kapoor-Alia Bhatt or Deepika Padukone-Ranveer Singh - Who Was the Best Dressed Couple at Zee Cine Awards 2019? The Zee Cine Awards 2019 took place last night and the whole of Bollywood gathered under one roof for the gala. Celebs like Katrina Kaif, Vicky Kaushal, Kartik Aaryan, Janhvi Kapoor, Malaika Arora, Alia Bhatt, Ranbir Kapoor, Deepika Padukone and Ranveer Singh attended the duo. One of the main highlights of last night's award show was that Alia and Ranbir danced on a romantic number right in front of everyone! The two took the centre stage and danced to Ishq Wala Love as the audience cheered for them. Alia looked very pretty in a white floral gown while Ranbir opted for a classic black suit, a white shirt and black pants. Of course their outfits were not high on the glamour quotient but they managed to pull if off with their style and sheer elegance. Zee Cine Awards 2019: These INSIDE Videos of Katrina Kaif and Vicky Kaushal Will Only Add Fuel to Fire to Their Dating Rumours. Another couple who was extremely well dressed at the Zee Cine Awards 2019 was Deepika and Ranveer. DP looked super stylish and chic in a hot red gown while Ranveer looked dapper in a black suit. For his performance, he stuck to his signature style of wearing flashy and loud colours. Along with his outfit, he wore a silver jacket which was also yellow and baby pink in colour. Here, take a look at their photos from last night's award ceremony. Zee Cine Awards 2019: Alia Bhatt and Ranbir Kapoor Dancing Together Will Make You Root for Their Ishq Wala Love – Watch Video. So now you guys vote and tell us who was the best dressed couple at the awards. Zee Cine Awards 2019 Full Winners List: Ranbir Kapoor, Deepika Padukone, Vicky Kaushal, Janhvi Kapoor Take Away the Trophies Home. Who Was the Best Dressed Couple at Zee Cine Awards 2019? Deepika won the award for Best Actor (Female) for Padmaavat while Ranbir won the Best Actor award (Male) for his performance in Sanju. Janhvi Kapoor, Katrina Kaif, Vicky Kaushal, Ayushmann Khurrana and Ishaan Khatter won big too.